Leukaemia is cancer of the white blood cells. In people with leukaemia, the body starts producing more white cells than it needs, many of which are abnormal. As the abnormal white cells accumulate, they interfere with the production of normal healthy blood cells, causing anaemia and susceptibility to infection. Who can be affected by leukaemia? People of any age, gender and ethnicity can develop leukaemia. Whilst the highest incidence of leukaemia is observed in older adults, leukaemia is the most common of all the cancers diagnosed in children. Leukaemia is more prevalent in white and black males than in Asian males and more common in white females compared to Asian or black females. Leukaemia tends to occur in elderly people and children. In the UK, the average age at diagnosis of leukaemia is 71 years, but leukaemia is also the most common childhood cancer; it accounts for about 33% of all cases of cancer in those under 14 years of age. Over the past years, the survival rates from leukaemia have greatly improved. 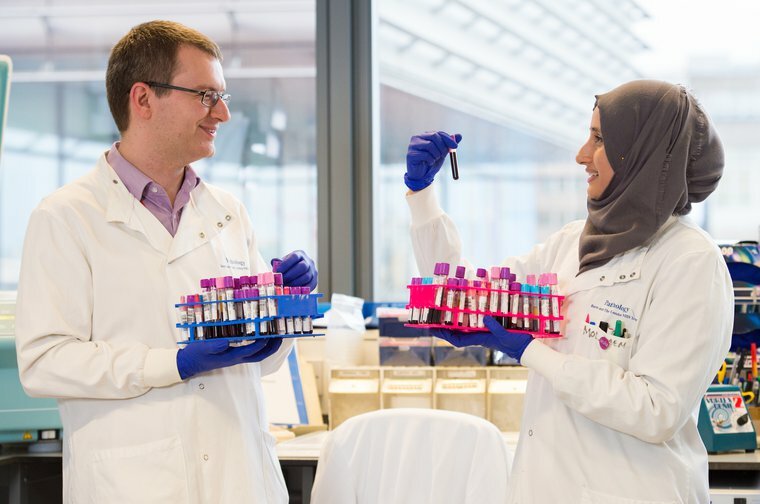 Scientific research is leading to a better understanding of leukaemia. This research, along with improvements in treatment and care, has helped to lower the number of leukaemia-related deaths. However, far too many patients still die from leukaemia; in particular older people continue to have very poor survival rates. 5 year survival from leukaemia in England, 2009-2013 is 50.1% for men and 49.4% for women.